Recent work has revealed the existence of a class of small noncoding RNA species, known as microRNAs (miRNAs), which have critical functions across various biological processes1,2. 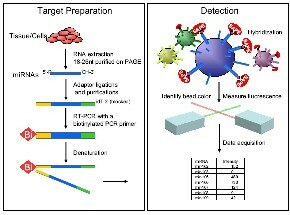 Here we use a new, bead-based flow cytometric miRNA expression profiling method to present a systematic expression analysis of 217 mammalian miRNAs from 334 samples, including multiple human cancers. The miRNA profiles are surprisingly informative, reflecting the developmental lineage and differentiation state of the tumours. We observe a general downregulation of miRNAs in tumours compared with normal tissues. Furthermore, we were able to successfully classify poorly differentiated tumours using miRNA expression profiles, whereas messenger RNA profiles were highly inaccurate when applied to the same samples. These findings highlight the potential of miRNA profiling in cancer diagnosis.